Everything in the 'Christian life' is dependent on how you perceive Jesus. Jesus is God -- and to the degree that you can comprehend HIM -- you understand God. Without a correct understanding of Jesus, any other emotions, faith, thoughts, acts, etc. -- are really are actually worship of a false God. The Justus Scrolls is right on the bullseye of everything that is -- or even could be -- true of what is called "Christianity" Even if he (the author) were wrong about the perception he gives of Jesus, it is still the one topic that any believer should be exploring. John understood Jesus better than the others. He saw the cosmic meaning. He did not get 'distracted' by the details -- the chronologies, the visits of the Magii, etc. He plunges straight into the meaning -- the WORD became Flesh. What the author has done is better still. He provides a synchronized story of the real Jesus -- capturing the world in which he lived. 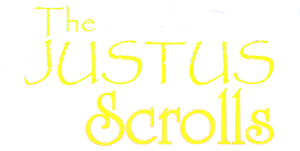 I think it would be better that people read The Justus Scrolls** than to read the 4 disjointed series of brief stories found in the biblical records. That is not blasphemy - it is just the simple truth. The money changers may make millions on their trivial books that I consider works of 'prostitution' -- meaning they are giving the 'johns' what will make them happy -- catering to the base self-centered passions of so many. I think that 90% of the best selling Christian books are such works of pandering. They are experts at telling 'Christian' people simple-minded and self-serving stuff that makes them feel good -- and no challenge to do anything at all. Let these authors collect their shekels selling this sweet 'cotton candy Christianity'. It is not real. The Justus Scrolls has its "rough edges", for sure. But it is REAL -- it possess INTEGRITY -- just like Jesus did. I am sure the moneychangers were back at the temple the next day. But the truth had been spoken there. It remains today, since the event of his overturning their tables remains, while the masses cannot even remember anything about their trade, their con game, or their names. I predict that the same will happen to this book. It may not be sold on the tables of the money-changers, but I bet that every person entering the Kingdom will be given a copy to read in the waiting room of heaven. Like God says himself -- "my word will not return void." This book expresses the word -- the fleshly word -- of the eternal Creator. **Let's see. You've got to be kidding, right? Right?